How to install front coil springs without killing yourself! Anybody who has ever tried installing coil springs on a car with no engine in it knows that putting them in can be a real challenge due to the fact that there isn't enough weight to hold the front of the car down. Here is how you do it easily and safely. You want your control arms mounted to the frame and swinging freely. You want to have all your ball joints in and ready to go along with the nuts that go to them. You want your steering knuckles clean and ready to mount. You want to have a large chain to use as a safety chain. You will also need a coil spring compressor and a large socket wrench to turn it. Don't forget a floor jack and a pry bar.....and of course, those crazy coil springs. My coil spring compressor was purchased from National Parts Depot under part # 988-1 for $35. A spring compressor usually comes with two ends that have hooks on them. One set of hooks slides freely up and down the long threaded rod and one actually screws onto the threaded rod. You need to remove the hooks that slide freely and set them aside. You want to use the hooks that screw up and down the rod. Drop the threaded rod down through the upper shock hole in the subframe. Make sure you have a couple stout washers underneath the head of the bolt. Screw the threaded hooks onto the end of the rod. If you are using the rubber spring isolators, attach them to the top of the spring now with plastic wire ties. Now mount the spring up into the subframe with the spring compressor going down through the center of the spring. Use the hooks to grab onto the spring at the lowest possible point. Make sure the threaded rod is centered in the spring. Make sure that the bottom end of the spring is rotated to the right spot so that when it's compressed it fits into the little pocket in the lower control arm correctly. Now begin to tighten down the big long bolt just tight enough to hold the spring in. 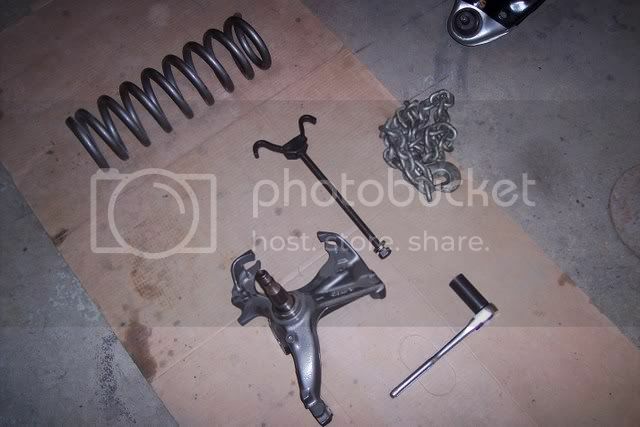 Once the spring is supported, use the safety chain to wrap through the bottom of the spring and around the subframe. This is a safety precaution just in case the spring compressor breaks or some other failure happens. These springs are very dangerous when compressed so do this EVERY time. Once your safety chain is hooked up, you can begin to tighten the big threaded rod and compress the spring up into the subframe. Once you have it compressed enough to swing the control arm up high enough, attach the steering knuckle to the lower control arm ball joint. At this point you should slide the floor jack under the lower control arm and use it to hold the control arm tight against the bottom of the spring. 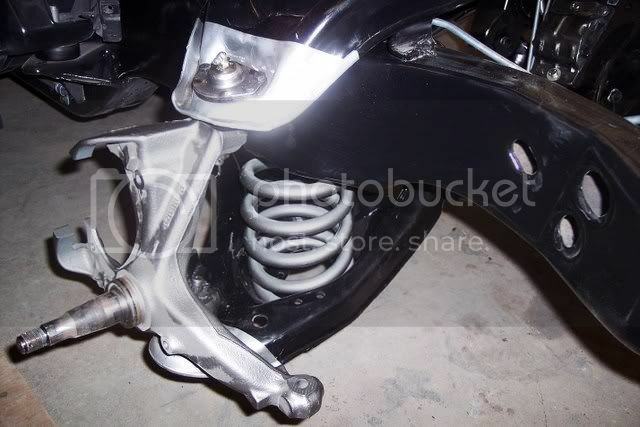 Use a pry bar to pry the bottom of the spring into the spring pocket on the lower control arm. It will pry in very easily and pop right into place. Now use the floor jack to jack up the steering knuckle high enough to attach the upper ball joint. Once the ball joint nuts are tight, you can remove the safety chain. Once your ball joints are all attached and your steering knuckle is in and the safety chain is off, you can take out the floor jack and then loosen up the spring compressor to let the full tension of the spring out on the control arms. The spring compressor rod just pulls out the shock hole and the hooks just fall out the bottom hole. Pat yourself on the back....you got your coil springs in without maiming anybody! What brand of internal spring compressor did you use ? I have broken 3 internal ones . and I bought a set of the external ones but the spring will not go up in the frame pocket with them on the outside. I have tried to do it as you have shown and the threaded nut strips out after I get about 2 3/4 inches compressed . I have tried to compress the spring as shown by the tool maker with both coil ends on , and as soon as i get down to around 3 inches it broke . I need to get them compressed down from 16 inches to about 12 1/2 to fit in . The motor is out of the car so I can't use any jack under the a arm method . I'm starting to wonder if the springs are to stiff. I purchased them new from Ames and they were made by moog for a 78 with a/c , and with performance suspension (WS6) .The springs are about a half inch longer than the old ones , have the same outside diameter , the same coil thickness . But the new ones have one extra wrap of coil versus the old . i used the spring compressor from napa and it worked realy well. Thank you for the post. It saved me alot of time and headache. My springs were only compressed down to 14 inchesand pry in the rest of the way. Re: How to install front coil springs without killing yourself! Great info, but I wish I would have known about this last year when I did the suspension on my 71. Installing the coil springs was by far the most p.i.t.a. part of the install. I did it the old fashion way by compressing the spring with the same spring compressor you have but hoping the spring would not kill me! I also did not have the motor (or any front end sheet metal) in the car so the car would raise if I used the floor jack method. just had to say, great advice! im currently restoring my 1970 lemans sport and was kind of worried about installing the front springs. i was able to rent for free a coil spring compresser (thanks to living in a small town) and installed them just like you said. i did have the motor and trans in the car so that helped with the spindle install, but it still would have worked without it. i was able to get them in by myself, and yes without killing me! thanks for helping us shade tree mechanics and now my car is ready to rock! Thank you for this. This was very helpful. Thanks for posting this. I'm just starting this job and wondering the best way to attempt it. Great info. Thanks! Great info Jason. I would like to share a tip that I used when I installed my springs. Instead of prying the spring into the lower control arm and using a floor jack, I used a couple of ratchet straps. One was hooked onto one of the lower coils and to the opposite side of the subframe and the other was on the lower control arm to the upper control arm once the spring was in position on the lower control arm. As I compressed the spring I tightened the ratchet strap attached to the spring to keep it inline with the lower control arm. Once the spring was compressed and the ball joints lined up the other strap was tightened to bring everything together. Worked like a charm! how hard is this exact method with the inner and outer fender still on? also say i didnt use a compressor (my engine is in also) could one use the jack method with a safety chain of course to remove the springs?? Basicly when the lower arm (LCA) is supported and unbolted from the spindle (at the ball joint) does the LCA swing down far enoght to let the spring come out without it being compressed 1st? great info. i have been thinking about lowering my 79 T/A with ratial tuned supention. i was looking at the eibach kit with two front springs that lower it an inch. then just som new shocks out back and blocks of aluminum under the leaf springs to get the rear to sit a little lower also. 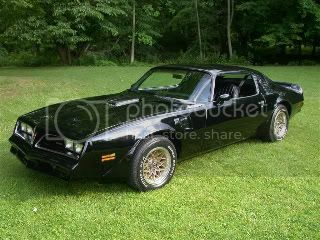 1979 T/A... Olds 403, Red on red w/ gold bird, and American Racing Outlaw 2 wheels--- Future= '73 400 swap w/6x-8 heads 'under way' (long way to go), 15x8 snowflakes (I'm cleaning and re-finishing), Macho T/A inspired silver/red paint-job, along with many other small projects with the car! I admire the amount of safety used in the pix and this tread. I was no where near as cautious when I did the springs in my 75 and 76, looking back I guess I should have been safer then using a gorilla bar and letting the springs fly(won't even mention the beer). I did however use the correct compression tool. I'm glad to see a safe instructive proceedure on removal and installation of coil springs. Installed both springs today in under 30 minutes, worked great, thanks for saving me grief. It's unreal how that shaft just fits in that hole, like it was made for it. I also used a plastic washer under the steel washer on the top so it didn't scratch the subframe at all. I did a 69 Camaro a few years back, and I don't think the hole was big enough to do it this way, and man was that rough. Thanks Jason, great stuff. I just used this method last night. It work very well!! Best $35.00 I have spent yet. I used the jack to lift the lower control arm and the spring popped into the pocket. 1 of 815 4spd W72 formulas, now a TA clone, 461 stroker, DN 5spd, 4wd, full VSE stage I & II kits as well as some stage III items. DSE sub frame connectors. But how do you take them off? Same way, but reverse order, I just did this on my car. Put the bottom arms on the spring about 2 coils from the bottom so when you decompress the spring, it should be out of compression when the jaws reach the end of the 'jack screw'. I would also buy some decent grade 8 washers for the jack screw. The ones that came with it are cheap and mine tore up. Honestly, I don't recommend removing them the way I did. Any hoo, I used an 8 foot section of rebar and threaded it down through the shock mounts in the frame and the lower control arm. The car was in the air a few feet and the front clip & motor were removed. I chained the spring to the frame & lower a-arm. 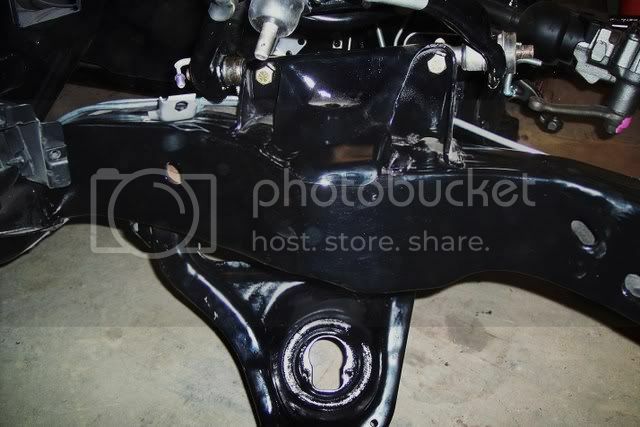 I stood inside the frame and removed the lower ball joint nut. I believe I used a ball joint puller and seperated the ball joint with a long extension and a long handled ratchet. It made a lot of noise when they popped but no drama. The chain and rebar combo restricted the spring's motion. It helped that there had been a coil cut off & flattened previously so the spring length (potential) wasn't as long. Again I was in a hurry to pull the front end apart, it was late and I didn't have access to a spring compressor. Stupid? Yes. Don't do it. spring is still tight against top - slowly loosen compression tool. Looks like I need to remove the swaybar from the lower A-arm too. ? yep..sure do, or it can't drop enough. lol...you hope....they can bounce a long way! Yep! The springs in my 70 wouldn't come out without compressing them even with the LCA all the way down. I won't be doing it that way again though! Yep..... did this procedure today. Just wanted to add that there are different types of internal compressors. One has "arms" that are only a 90* angle from the hub on the screw shaft. DO NOT use this kind! It's a piece of garbage and the coil spring will come flying out when it's compressed. The other type has arms that have the actual "hook". This one will completely secure the coil spring while it's being compressed and is much safer. Also, it does help to liberally grease the thread on the screw shaft and the two washers that are near the top of the screw shaft. Makes turning it A LOT easier and will keep the threads from getting damaged. I completely annihilated a spring compressor today because I made the mistake of NOT lubricating the threads. Just a quick question though, Is there a reason the area on the A arms by the ball joint are not painted, I am sending out my Sub-frame and Arms to get blasted and powder coated and was curious about the A arms being fully painted. The factory dipped the arms in paint but not the tip area with the ball joints. That area was left bare steel. So does it make any difference whether that area is painted or not? I think it had more to do with cost of production/efficiency more than anything else. I inquired about having it replicated when I had my arms powder coated but it was going to cost too much money for the type of build I'm doing so I just did the whole arm in one color. This is how I did mine. I used a length of 16mm threaded rod, a piece of square steel tubing with a piece of steel welded on it to add some strength, a piece of 1/2" steel water tubing as a spacer and some 16mm nuts. I installed the threaded rod thru the upper shock mounting hole, upper and lower A-arms, spring and square steel tube under the lower A arm. The 1/2" steel tubing is just a spacer to gain easier access to the nut that will need to be tightened to pull it all together. It went together without any problems. I used a cargo strap to pull the lower A-arm bushing into the frame mount, but it did not need much force applied to it at all. It just needed to be tilted a little. 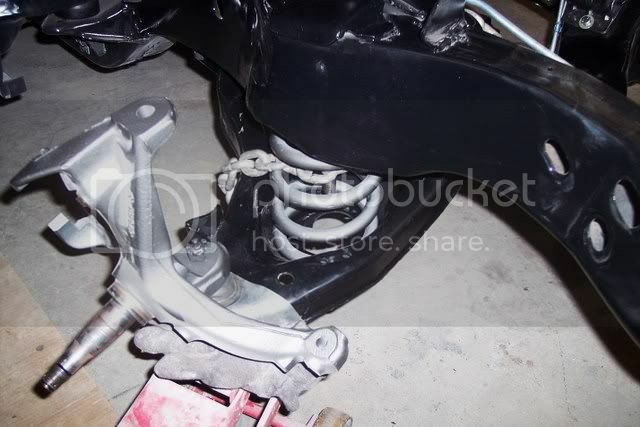 This method can also be used with the subframe in the car. The shocks have to be removed right?? Im about to tackle this project over the weekend Im taking the coil springs out then after I get all my new parts in then will have to reinstall,, also what about alignment?? any tricks on getting it close enough till you can get it to place that does alignments? 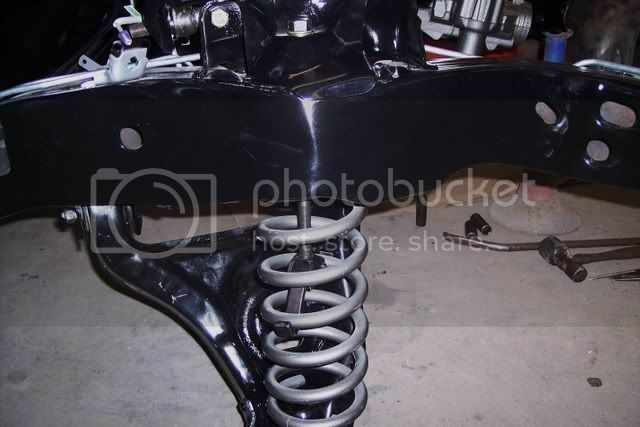 Yes, the shocks need to be removed to gain access to the inside of the coil spring and allow the arm to swing free. If you are just replacing the bushings and not using the offset cross shafts then you should be able to put it back close to the alignment. Make sure you keep track of the shim stack on each bolt so you can reinstall them in the same position. I removed mine this way but installed them with a homemade compressor like the one shown in this thread. Mine wouldn't swing down enough either. Was stupid and gave them a kick. Luckily they just fell out. Now to find that compressor. Thanks for the instructions, it ought to make my install less worriesome.